The New BAT is the first slingshot designed to hold a MINI MAGLITE Flashlight (not included) for night shooting! THE BAT combines Fiber-Optic-Sights with rotating prongs. Optic-sensors capture light to make the red and green sights glow for sharp visability. The new sights increase accuracy & prolong band life by pivoting 180 degrees around the fork. The adjustable stabilizer counteracts and reduces the recoil when the slingshot is shot. The sliding handle chamber holds 10 count 5/16" ammo (no ammo supplied). Tough Nylon frame, red Tapered powerbands with split-leather pouch. 185 Yard Range! All Trumark products are made in the USA to the highest standards - we aim to stock the complete range of Trumark products. 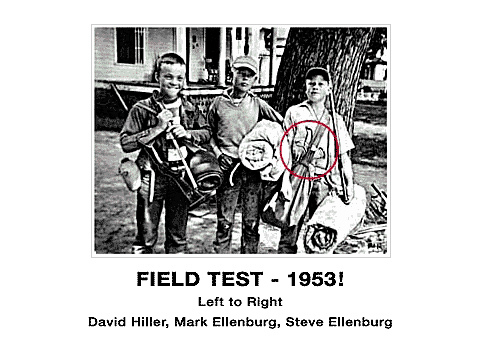 COLUMBUS, NEBRASKA USA: Shown above is the first wrist-braced slingshot that was invented by Howard Ellenburg and his sons in the winter of 1953. NOTE: Slingshots in Europe and other countries are usually called Catapults or Katapults. Using a few simple tools, Trumark's first prototype slingshot was bent into shape on the bumper of a 1946 Willy's Jeep! A dog-collar was used to strap the brace to the wrist. This proved to be successful. The next version eliminated the collar, and incorporated a continuous metal brace that started at the bottom of the hand and wrapped (locked) over the top of the wrist. A recoil pad was then added to protect the shooter's wrist. This 2nd version was Trumark's first commercial model and was called Howard’s Wrist-Locker Slingshot. The original production line was set up in an old abandoned beer hall in the little town of Duncan, Nebraska. The first company to distribute "Howard’s Wrist-Lockers," was Dura-Pak Sporting Goods Company in Sioux City, Iowa. The prototype slingshot / catapult (the dog-collar model, in the red circle) was originally invented to shoot snowballs that would penetrate the neighboorhood kids' snowforts, the "enemies", that kept springing up across the street in Norfolk, Nebraska. (This was just a few blocks away from where Johnny Carson grew up!) Since the powerbands had to be strong enough to hurl a small snowball through a big slingshot fork, the wristbrace was created in order to withstand the heavier draw of the bands. To increase the power even more, the square frame was soon changed to a round rod so that surgical tubing could be tried as powerbands. During that time, Chinese finger-trap tubes (nick-named "handcuffs") were popular at the local carnivals, and the concept behind the traps worked successfully as the way to attach tubing to the slingshot / catapult without strings or glue! Attaching high-powered latex tubing to forks with PRONGS bent backwords towards the shooter was a break through in slingshot technology by Trumark. This new method to attach surgical tubing to the slingshot also lowered the costs of production. At the same time, Trumark also invented the "tube through-the-hole method" to attach the pouch to the tubing. This eliminated the old way of using string to tie the bands to the pouch, and further improved the "look" and reliability of the slingshot / catapult. In later "powerbands" the "tube through-the-hole method" was replaced by a plastic pin to eliminate punching a hole through the tubing near the leather pouch. 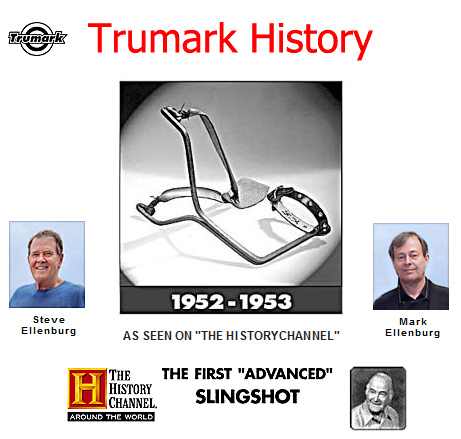 Slingshots / catapults manufactured around the world today are still based on the ideas pioneered by Trumark in 1953. Although the original models worked well as wintertime "fort busters", Trumark evolved the slingshot / catapult into models that could be sold throughout the year. Trumark has manufactured millions of slingshots over the last 55 years, and continues to lead the way forward in slingshot design and development.